Here we have our swirly pumpkin applique shirt and pants perfect for a Disney trip around Thanksgiving. The shirt is made of a fine white cotton made just for appliques and monograms. 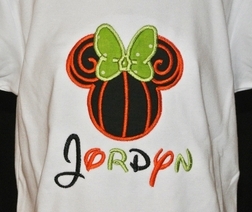 Our ever popular swirly pumpkin and ears Minnie Mouse pumpkin in black and trimmed with orange satin stitch is appliqued on the front of the shirt. 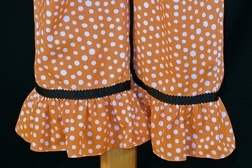 The shorts/capris/pants are made with orange with white dots fabric and trimmed with a ruffle and black with scalloped edge ribbon just above.